Thommanon is a small temple built at the end of Suryavarman II's reign, around the middle of the 12th century. It is nearly symmetrical to Chau Say Tevoda, another of Suryavarman's temples that stands nearby. Although the placement of Thommanon and Chau Say Tevoda neatly frame the east causeway to the Angkor Thom complex, this was probably not the original intention, since in Suryavarman's time the center of the capital was closer to Angkor Wat. Thommanon is architecturally more advanced than its predecessors. The designers took advantage of the natural qualities of sandstone, rather than simply carving it in imitation of wood. Thommanon is a single-towered temple with an east-facing central sanctuary, crowned by a prasat, or tower. 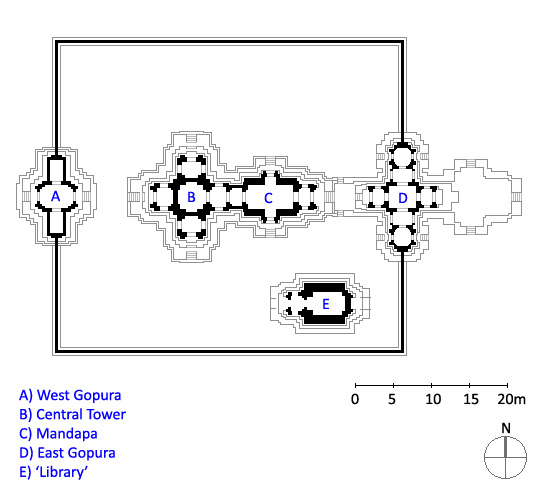 Access from the east is via a gopura, followed by a mandapa, or antechamber, before arriving at the central sanctuary. The temple's carvings are very well preserved and the aged sandstone provides a distinct contrast to the surrounding jungle. The architectural style of its tower is also akin to the Ankor Wat temple and the Chau Say Tevoda in its vicinity.The temple is much better preserved than the nearby Chau Say Tevoda, which is undergoing restoration, though both temples are similar in design. The reason for better preservation of Thommanon is attributed to the fact that its super-structure does not have stone-enclosed wood beams. Thus, adoption of sandstone as the medium for carvings in this temple has made it more advanced in its architectural design vis-à-vis other temples in its vicinity, which were mostly wood-based. All doorways include carved pediments. The compound walls around the temple have all disappeared, leaving only the entry gates on the east and the west; the central tower is all that remains of the main temple. It is inferred that both Thommanon and Chau Say Thavoda were interlinked to the central tower under one large compound with large gates. The independent building separated from the main temple was the library. 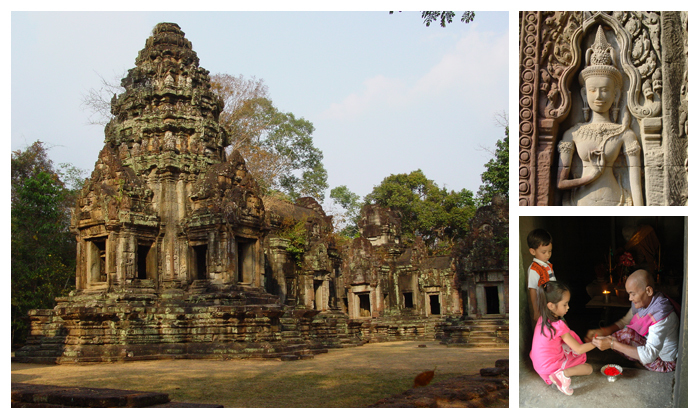 Images of Devatas, the female divine carved figurines, are seen in profusion here, as in other Khmer temples. They are the centre of attraction in Thommanon. The devatas depict flower crowns, sampots (Cambodian skirts), necklaces, armbands, belts and ankle bands. The mudras displayed are complex. The devatas grip the flower very distinctively, holding the ring and middle fingers against the thumb, while the index and small finger are extended. One Angkor researcher calls this position the “devata mudra”, and notes it is also prominent at Angkor Wat. The sampots of the devatas though are divided into two distinct types of sampot, one type is the ancient pleated style, seen in the Bakheng period at Lolei and Phnom Bok (900 AD), and the other is a patterned fabric style with folds and “tail” seen at Angkor Wat.